We held our annual DC Candlelighters and Growing Hope Holiday Party on December 2nd. What a joyous event it was! We had over 70 families attend the event this year! We hope you all had a wonderful time. 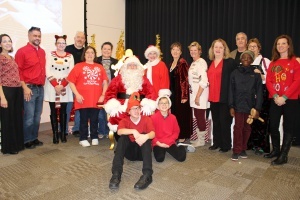 Below is all of the photos from the wrapping party to the event and meeting Santa. All of the wonderful gifts are wrapped before the party by Santa’s Elves AKA the Chantilly Youth Association. Thank you all for your volunteering and wrapping all of the presents! View the SillyShotz photos: SillyShotz Holiday Party 2018. You can also download all the SillyShotz photos using this link: DOWNLOAD SillyShotz Photos – The link is valid for 2 weeks, password is 1202. Thank you to all of the volunteers that helped make this event so amazing! And thank you to ALL of our AMAZING VOLUNTEERS that helped set up and clean and make sure all the families had a wonderful time! Also Thank You to Michelle Bloxton at BluSage Catering for the yummy food! A special thank you to Margy Jost and Growing Hope, we are so thankful for your partnership, assistance and Gift Cards for the families over the years. You truly have made this event a wonderful and memorable time for the families. Our annual Holiday Party is made possible because of all the donations we receive throughout the year. Thank you from all of us at DC Candlelighters to everyone that has donated!